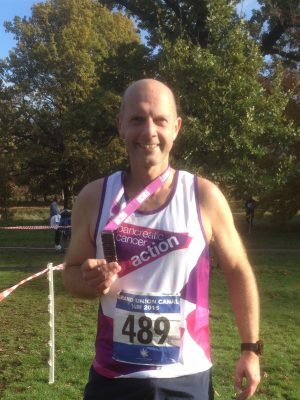 Tim Robinson, 47 of Stevenage, has taken up the extraordinary challenge of running 50 miles over the course of November to raise money for Pancreatic Cancer Action. He is a keen and active member of his local running club ‘Fairlands Valley Spartans’ and has been inspired to raise funds to show his support for fellow runners affected by pancreatic cancer. Tim, who hopes to raise over £1,000, said: “I decided to take part in this challenge for Pancreatic Cancer Action when I heard about them on the radio. In 2009 my mum was diagnosed with pancreatic cancer and died shortly after. Tim will be taking part in the Stevenage Half, Grand Union Canal Half, St Neots Half and Bassingbourne ten mile all before the end of the month. Pancreatic Cancer Action is committed to working towards earlier diagnosis of the disease so that surgery, currently the only cure, is made available to the sufferer. Pancreatic cancer is the UK’s fifth biggest cancer killer and 26 people die a day from the disease. The 5-year survival rate is just 5%, a figure which has barely changed in over 40 years. To sponsor Tim please visit https://www.justgiving.com/fundraising/Tim-Robinson11 . From running your local 5K to skydiving, and cycling from London to Brighton to walking the Great Wall of China, Pancreatic Cancer Action has a number of ways you can take part in a fun fundraising activity. To find out more, please visit http://pancreaticcanceraction.org/support-us/fundraise/ or call 0303 040 1770. Previous Article Dr Ellie joins Pancreatic Cancer Action as ambassador to support their work with GPs Next Article On November 17, show the world you are #InItTogether in the global fight against pancreatic cancer!